Adam Wilczewski is the Director of Strategic Partnerships in the International Trade Administration’s U.S. Commercial Service. Stephanie Smedile is the Strategic Partnership Manager overseeing the U.S. Postal Service relationship. The National Export Initiative is already driving broad government coordination – just take a look at www.trade.gov/nei to see what’s happening – but now the private sector is engaging in new ways, too. 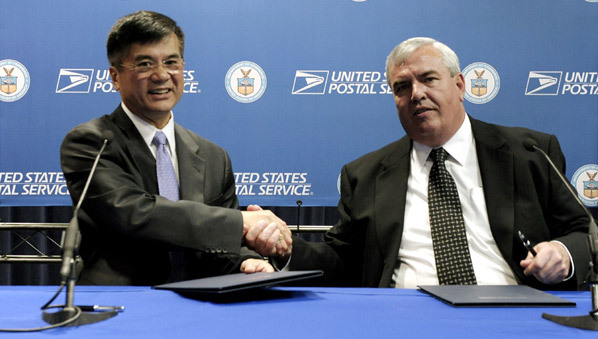 Commerce Secretary Gary Locke and U.S. Postmaster General John Potter shake hands after signing agreement to boost Exports in a ceremony on July 12, 2010. Today Commerce Secretary Gary Locke and the U.S. Postal Service’s Postmaster General & CEO, John Potter, announced the launch of a new effort, the New Market Exporter Initiative (NMEI), to help boost U.S. exporters. The NMEI will identify current U.S. Postal Service customers who are exporting their goods and services abroad, and working with ITA, help them expand their reach to additional international markets. This initiative builds on an already successful relationship between the U.S. Postal Service and the U.S. Commercial Service’s Strategic Partnership Program. With less than one percent of America’s 30 million companies exporting, and of those companies exporting, only 58 percent selling to one international market, we know there is potential for American companies to expand export sales. The NMEI’s goal is to educate U.S. exporters, particularly small and medium-sized companies, about the benefits of expanding their exports to additional markets. In addition, we want to inform them of the public and private sector resources to assist them. To reach our goal, we are engaging partners like the U.S. Postal Service, FedEx, and UPS to provide assistance to targeted exporting customers. The buzz is already starting – take a look at Bloomberg’s Businessweek or PR Newswire to learn more about today’s event.